Swashbuckling Theans have more to worry about than sharp blades. Sorcerous bloodlines, born from an unholy bargain struck centuries ago, control powers beyond belief. Fate witches twist the strands of destiny to their own devising. Laerdom rune mages call upon the forces of creation itself. Porte sorcerers tear holes in the fabric of reality, while Glamour mages possess the strength of legends brought to life. From the sinister corruption of Zerstorung to the shapeshifting abilities of Ussura's nobility, magic is all around. You simply have to know where to look. 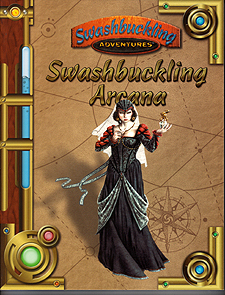 Swashbuckling Arcana is the definitive sourcebook for magical powers in an era of pirates and musketeers. It includes rules for the major sorcerous powers in the world of Theah, easily transferable to any swashbuckling campaign. Complete details on eight powerful schools of swashbuckling magic - from teleporting Poete mages to the explosive fires of El Fuego Adentro. Numerous "alternative" schools of magic, including the sinister Blood Scientists and theburgeoning power of gadgets and inventions. Fully compatible with d20 System rules.